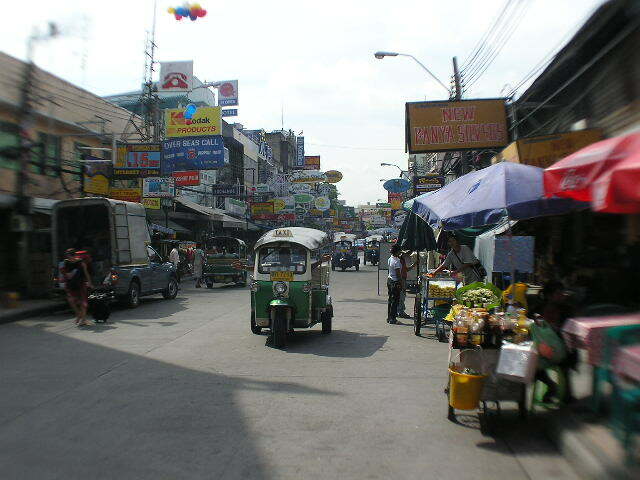 Above is the infamous Khoa San Road where 99.999% of travellers stay in Bangkok. To many travellers it's where the backpackers hang out (backpackers are far below travellers remember?) and enjoy the easy life of travel on the road....banana pancakes, good food, and constant movies in every single restaurant. The pavements are crammed with stalls selling everything the traveller will never need but doesn't know it yet and the road is clogged by food carts and stalls selling fake CD's. At nightfall Khoa San is closed off to all traffic and transformed into an almost Disneyland area. Daffy and Goofy would slot in nicely down here (and I'm not taking the Mickey:). 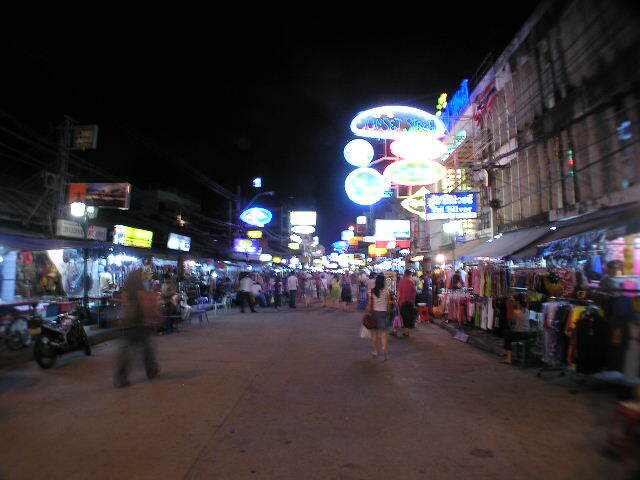 Most travellers just walk up and down the road all night doing nothing at all and then going to bed, although thesedays it seems many people are coming only to Thailand to stay on Khoa San for the party life. Enough of Khao San for now....must move on to better places and relax at Kanchanaburi on the river Qwai. 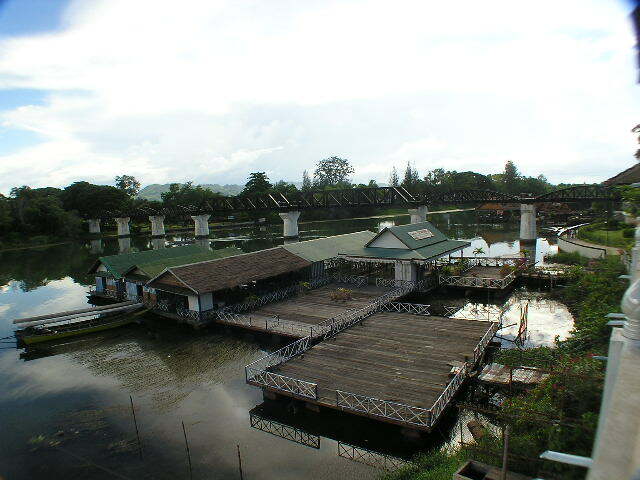 Kanchanaburi is a mere 2hrs from Bangkok and is a great place to relax. It's a relatively peaceful place and is full of great guesthouses and restaurants. Above is the bridge over the river qwai. I think the two sections in the middle that are different have been rebuilt after allied bombing. The huuuuge floating platforms in the foreground are sort of mobile discos that are toed up and down the river by noisy tug boats, only the boom boom boom of the disco blocks out the noise of the boat. 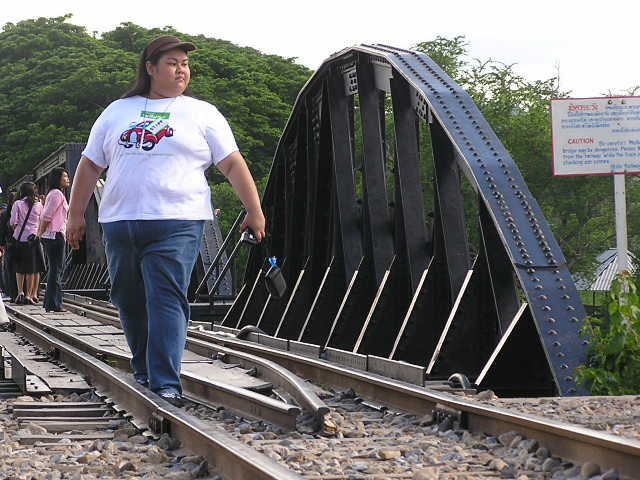 Tens of thousands were killed building to Thai-Burmese railway and it still stands today which shows what a remarkable piece of engineering it is. If proof is needed of the engineering excellence of the bridge just check the pickie below....had a near death experiance when I was halfway across the bridge only to see a fat chick walking across, thought two more new sections would need to be built velly shortly....definately scarierer than an allied air raid! Below is a picture of the Jolly Frog Guesthouse where one always stays when one is in this neck of the woods. It's owned by a German chick who for some reason married a local guy (more to the point who'd want to marry a German?) and set up shop here. That said the gueathouse is one of the best in SE Asia. Less than U$2 for a single room with outside bath. 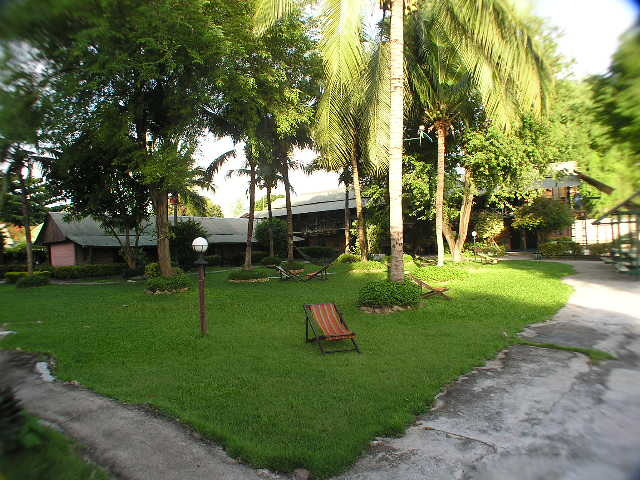 The grounds are spotless and peaceful. The peace being punctuated only by the sound of package tourist charging upstream in their high powered Thai style speed boats.